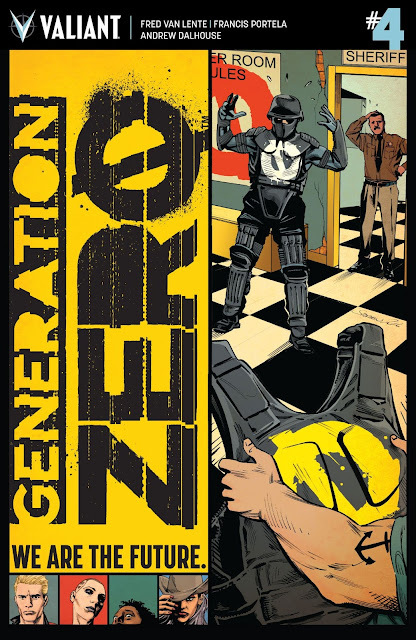 Generation Zero draws to the end of the arc with a character-driven issue that exposes more about the team in the midst of a precarious battle against an unknown foe. Fred Van Lente reveals layer after layer of his protagonists and soon Keisha herself understands this is far from a game. And who would blame these powerful psiots who've had to endure so much? First, forced to serve as child soldiers stripped of a normal childhood. Then as escapees who bond together to protect one another in a world that fears and hates them. They've insulated themselves and found a common cause with Christian as their leader. Their innocence has been lost and now must use their extraordinary skills to survive and help others. What the issue lacks in action makes up for in a more emotionally charged interpersonal interactions. Telic and Animalia emerge with personality traits that ring true. Keisha is our guide into this world, the character we identify with to a certain degree. She strives to be different because she sees herself that way when in fact she's normal. The contrast is never clearer than when in the presence of the Generation Zero kids. These psiots are the true "aliens," misunderstood and demonized. Her well-intentioned advice to her brother Kwame is what a big sister should do but as teens often do, they put their own interests ahead of the interests of others. The opposite of what the GZ kids are doing now. We get the perspective from Kwame who's autistic and highly gifted intellectually. He's left on his own and we’re treated to his worldview. There are certain aspects that appear different through his eyes. Strangers look more suspicious, the warnings of his sister echo in his mind. He's devised an intricate and precise plan to get home avoiding all the dangers Kiesha told him about. Except there was one danger he couldn't avoid. Artist Francis Portela and colorist Andrew Dalhouse continue to produce some sharp, detailed, and colorful illustrations. The pacing in the layouts drive the action even if it's just Telic telling Kiesha off. It's displayed with deliberate anger and menace that builds from one panel to the next. Dalhouse infuses the scenes with rich colors that add warmth and texture. Generation Zero #4 is honestly a good character-building read but perhaps not the issue to jump into if you haven't read the last three. Within the arc's context, it fills in a lot of information but more rewarding for readers who've read the series from the start. So I urge you to catch up, buy issues 1-3 and see what I mean. Van Lente and Portela have something explosive in the works and you won't want to miss it.